The Painted Portrait Blouse & Dress is an avant garde take on the empire silhouette and at the same time fashions either a patchwork or solid yoke - each framing your face and your figure beautifully. A perfect year-round pattern whether you love the ease of a sleeveless blouse or the comfort of a pocketed dress. 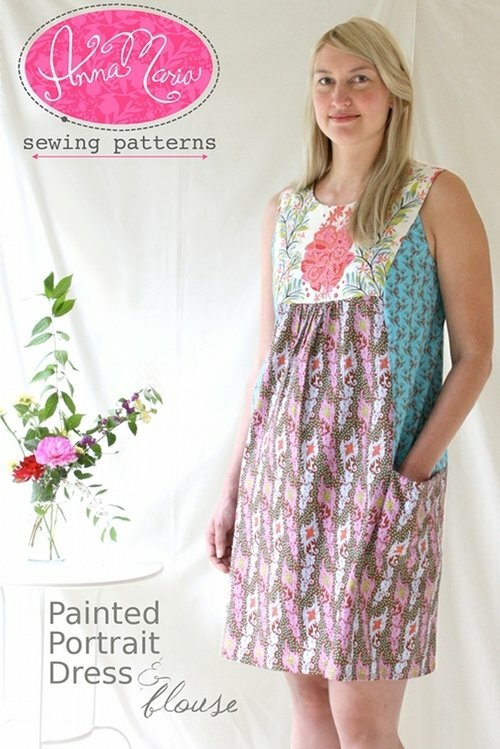 This one single pattern offers so much variation that you'll want to try every option. (This pattern accommodates size XS through XL.) The following details the finished garment dimensions which includes the appropriate ease for the particular garment style. XS: bust 34 7/8", waist 37 7/8"", hip 45"
SM: bust 36 7/8", waist 39 7/8", hip 47"
MD: bust 38 7/8", waist 41 7/8", hip 49"
LG: bust 40 7/8", waist 43 7/8", hip 51"
XL: bust 42 7/8", waist 45 7/8", hip 53"
*For all options, you'll need an additional 3/4 yard for facings and bias *For all options, if making a pieced style yoke (shown on cover), you'll need 6 assorted scraps that are approximately 8" x 15"